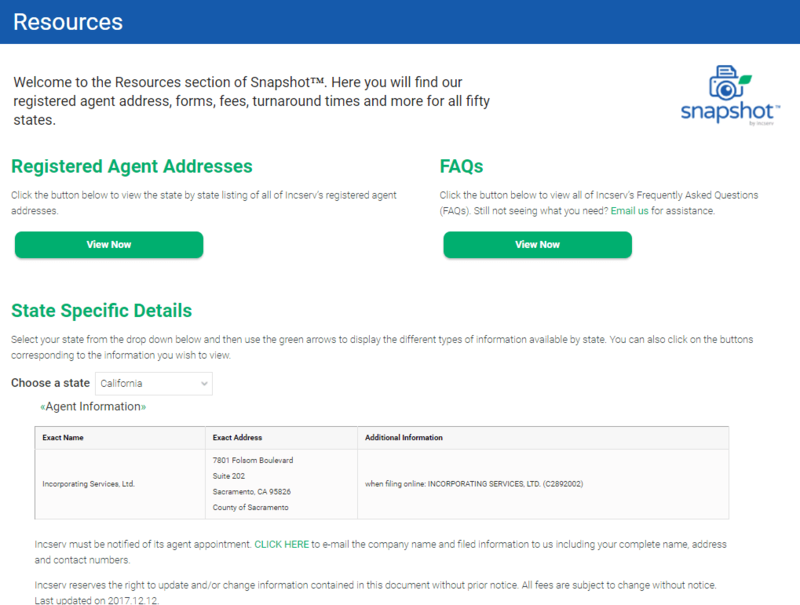 Whether you only have one company with us or dozens, you will find useful information in our Resources section of Snapshot™! There are two sections to our Resources section – Registered Agent Addresses and State Specific Details. On this page, you will find a current list of Incserv’s address in each of the 50 states! So whether you are interested in qualifying your entity in another state and need our agent address for the form you are filing directly with the State, or you would like the information for your records, you will find that information here! Also note that we list our name in each state – for example, in Alabama, our name is ISL, Inc. If you are filing a formation, incorporation, or qualification document in another state, the form will require the registered agent’s name exactly as it appears in our database. This list is updated often, so always ensure you check back for the most recent information! If you have any questions about navigating our Resources section, or any section of Snapshot™, feel free to give us a call and we’ll be happy to walk you through our online client portal and answer any of your questions!